British-born Sally Jones is a U.N.-designated recruiter and propagandist for ISIS. Nonetheless, Jones has continued to operate on Twitter, threatening the lives of U.S. veterans Robert O’Neill and Dillard Johnson, among others. As recently as May 2016, Sally Jones issued terrorist threats against the United Kingdom, including calling upon Muslim women to launch terrorist attacks in London, Glasgow, and Wales during Ramadan.Alexandra Sims, “Sally Jones: Isis recruiter 'issues series of terror threats against UK cities' over Twitter,” Independent (London), May 26, 2016, http://www.independent.co.uk/news/world/middle-east/sally-jones-isis-recruiter-issues-series-of-terror-threats-to-uk-cities-over-twitter-a7049066.html. Jones’s activity online falls in line with her role as leader of the secret “Anwar al-Awlaki” battalion’s female wing. In this role, Jones is responsible for training all European female recruits, or “muhajirat,” in the use of weapons and tactics. These muhajirat are then trained and instructed to carry out suicide missions in the West, according to leaked ISIS documents.Jodie Ensor, “Revealed: Isil bride Sally Jones's role in training female recruits for attacks on West,” Telegraph, September 11, 2016, http://www.telegraph.co.uk/news/2016/09/11/revealed-isil-white-widow-sally-joness-role-in-training-female-r/. A Twitter account—purportedly operated by Jones—links to a U.S. government website announcing her U.S. designation. Sally Jones threatens specific members of the U.S. military on October 3, 2015, five days after her U.N. designation. Sally Jones threatens specific members of the U.S. military on October 8, 2015, ten days after her U.N. designation. Jones was the wife of Junaid Hussain, the deceased British computer hacker formerly in charge of recruiting new hackers to ISIS. After Hussain was reportedly killed by a U.S. drone strike in September 2015, Jones boasted that her husband was killed by “the greatest enemy of Allah.”Tom Whitehead, “Widow of British jihadist ‘proud’ he was killed by US,” Telegraph (London), September 15, 2015, http://www.telegraph.co.uk/news/worldnews/islamic-state/11866046/Widow-of-British-jihadist-proud-he-was-killed-by-US.html. Jones, who goes by the moniker “Umm Hussain al-Britani,” has used her Twitter account to propagandize for the group and release incendiary statements, including her wish to behead a Western prisoner in Syria and behead Christians with a ‘blunt knife.’Chris Greenwood, “Revealed: Benefits mother-of-two from Kent once in all-girl rock band who is now jihadi in Syria - and wants to ‘behead Christians with a blunt knife,’” Daily Mail (London), last updated September 1, 2014, http://www.dailymail.co.uk/news/article-2739006/Revealed-How-middle-aged-mother-two-Kent-used-girl-rock-band-reinvented-jihadi-threatening-behead-Christians-blunt-knife.html. She has also served as a recruiter for ISIS,“Security Council Al-Qaida Sanctions Committee Adds Names of Four Individuals to Its Sanctions List,” United Nations, September 28, 2015, http://www.un.org/press/en/2015/sc12059.doc.htm. and has used social media to incite to violence. In September 2015, Jones threatened U.S. military personnel, publishing 100 soldiers’ personal information in a “kill list.” Jones has also made individual soldiers the subject of her tweets, including a Navy Seal veteran who took part in Operation Geronimo to kill Osama bin Laden and a former army sergeant.Umm Hussain Britaniya, Twitter post, October 8, 2015, 1:16, p.m., https://twitter.com/OumHussain1/status/652170797914566656. Before converting to Islam and joining ISIS, Jones reportedly lived on welfare and played guitar in a punk rock band. Soon before she fled to Syria, Jones worked as a perfume saleswoman for L’Oreal cosmetics.Colleen Curry, “A British Mother Reportedly Left Welfare Behind and Is Now Helping Recruit For The Islamic State,” Vice News, December 22, 2014, https://news.vice.com/article/a-british-mother-reportedly-left-welfare-behind-and-is-now-helping-recruit-for-the-islamic-state. She was reportedly interested in and contributed to online forums on conspiracy theories, black magic, and witchcraft.Chris Greenwood, “Revealed: Benefits mother-of-two from Kent once in all-girl rock band who is now jihadi in Syria - and wants to ‘behead Christians with a blunt knife’,” Daily Mail (London), last updated September 1, 2014, http://www.dailymail.co.uk/news/article-2739006/Revealed-How-middle-aged-mother-two-Kent-used-girl-rock-band-reinvented-jihadi-threatening-behead-Christians-blunt-knife.html. Sally Jones and her ten-year-old son live in ISIS-controlled Raqqa, Syria.Colleen Curry, “A British Mother Reportedly Left Welfare Behind and Is Now Helping Recruit For The Islamic State,” Vice News, December 22, 2014, https://news.vice.com/article/a-british-mother-reportedly-left-welfare-behind-and-is-now-helping-recruit-for-the-islamic-state. @OumHussa1nUmm Hussain Britaniya, Twitter post, October 5, 2015, 4:41, p.m., https://twitter.com/OumHu55a1n/status/651180354519199744. @OumHuSS4ainMustafa Headoff, Twitter post, October 5, 2015, 2:31, p.m., https://twitter.com/therealkuffar/status/651147806086795264. @Umm1337Umm Hussain Britaniya, Twitter post, October 5, 2015, 4:41, p.m., Umm Hussain Britaniya, Twitter post, October 8, 2015, 1:16, p.m., . @UmmHussain_1CEP, Twitter post, September 14, 2015, 10:32 a.m., https://twitter.com/FightExtremism/status/643477506604048384. @_UmmHussain1Abdullah Khan, Twitter post, September 29, 2015, 1:42 p.m., https://twitter.com/AbuSaffiyah01/status/648960991519182848. @UmmHussain110UmmHussainBritāniya, Twitter post, June 11, 2015, 2:50 p.m., https://twitter.com/UmmHussain110/status/609115468562087936. 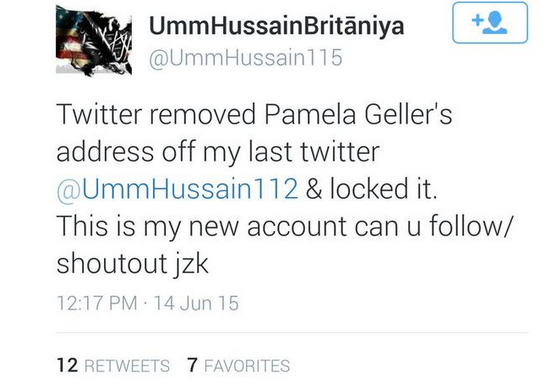 @UmmHussain101UmmHussainBritāniya, Twitter post, June 11, 2015, 2:50 p.m., https://twitter.com/UmmHussain_10. @UmmHussain_10UmmHussainBritāniya, Twitter post, June 11, 2015, 2:50 p.m., https://twitter.com/UmmHussain_10. @UmmHussain112UmmHussainBritāniya, Twitter post, June 14, 2015, 12:17 p.m., https://twitter.com/search?q=ummhussain115&src=typd. @UmmHussain115UmmHussainBritāniya, Twitter post, June 14, 2015, 12:17 p.m., https://twitter.com/search?q=ummhussain115&src=typd. @UmmHuSSain31337Damien Gayle, “Families of Isis jihadis dismiss UN sanctions as ‘grandstanding,’” Guardian (London), September 29, 2015, http://www.theguardian.com/world/2015/sep/29/families-isis-jihadis-dismiss-un-sanctions-grandstanding. @UmmHussein_15 Umm HussainBritāniya, Twitter profile, accessed August 1, 2015, https://twitter.com/UmmHussein_15..
@UmmHussein_16 Umm HussainBritāniya, Twitter profile, https://twitter.com/UmmHussain_16..
@UmmHussein_18Umm HussainBritāniya, Twitter profile, accessed August 13, 2015, https://twitter.com/UmmHussein_18. @UmmHu55ainBr1tUmm Hussain Britaniya, Twitter, accessed October 3, 2015https://twitter.com/Umm_Hu55ain911/status/651749090645155840. @UmmHu55ainIntelGhost, Twitter post, September 16, 2015, 3:49 p.m., https://twitter.com/intel_ghost/status/644100684476977152. @Umm_Hu55ain911Umm Hussain Britaniya, Twitter post, October 7, 2015, 6:21, a.m.,https://twitter.com/Umm_Hu55ain911/status/651749090645155840. @Umm_Hu5541nDiva Knevil, Twitter post, October 20, 2015, 2:23, p.m., https://twitter.com/DivaKnevil/status/656581600159924224. Sakinah HussainColleen Curry, “A British Mother Reportedly Left Welfare Behind and Is Now Helping Recruit For The Islamic State,” Vice News, December 22, 2014, https://news.vice.com/article/a-british-mother-reportedly-left-welfare-behind-and-is-now-helping-recruit-for-the-islamic-state. Sally-Anne JonesKimiko de Freytas-Tamura, “U.N. Adds Four British Members of ISIS to Sanctions List,” New York Times, September 29, 2015, http://www.nytimes.com/2015/09/30/world/europe/un-adds-four-britons-to-sanctions-list-over-isis-membership.html?_r=0. Umm Hussain al-BritaniColleen Curry, “A British Mother Reportedly Left Welfare Behind and Is Now Helping Recruit For The Islamic State,” Vice News, December 22, 2014, https://news.vice.com/article/a-british-mother-reportedly-left-welfare-behind-and-is-now-helping-recruit-for-the-islamic-state. UmmHussainAlBritaniUmmHussainBritāniya, Twitter, accessed June 15, 2015, https://twitter.com/UmmHussain_10..
Umm HussainBritāniyaUmmHussainBritāniya, Twitter, accessed June 15, 2015, https://twitter.com/UmmHussain_10.. The U.S. Department of State designated Sally Jones as a Specially Designated Global Terrorist (SDGT) under Executive Order (E.O.) 13224.“Designations of Foreign Terrorist Fighters,” U.S. Department of State, September 29, 2015, http://www.state.gov/r/pa/prs/ps/2015/09/247433.htm. The United Kingdom designated Sally Jones as a terrorist, placing her under the United Nations sanctions regime.Simon Tomlinson, “British jihadi Sally-Anne Jones appears to mock Cameron on Twitter after being placed on UK's most wanted list of ISIS fanatics and hit with travel ban,” Daily Mail (London), September 29, 2015,, http://www.dailymail.co.uk/news/article-3253503/LOL-England-British-jihadi-Sally-Anne-Jones-appears-mock-Cameron-Twitter-placed-wanted-list-ISIS-fanatics-hit-travel-ban.html#ixzz3nG4TpPJI. The United Nations Security Council added Sally Jones to its Al-Qaida Sanctions List of individuals and entities subject to the assets freeze, travel ban and arms embargo set out in paragraph 1 of Security Council resolution 2161 (2014) adopted under Chapter VII of the Charter of the United Nations.“Security Council Al-Qaida Sanctions Committee Adds Names of Four Individuals to Its Sanctions List,” United Nations, September 28, 2015, http://www.un.org/press/en/2015/sc12059.doc.htm. British-born Sally Jones is a U.N.-designated recruiter and propagandist for ISIS. “London – Glasgow – Wales Booooom!”Alexandra Sims, “Sally Jones: Isis recruiter 'issues series of terror threats against UK cities' over Twitter,” Independent (London), May 26, 2016, http://www.independent.co.uk/news/world/middle-east/sally-jones-isis-recruiter-issues-series-of-terror-threats-to-uk-cities-over-twitter-a7049066.html. “England... Boom”Alexandra Sims, “Sally Jones: Isis recruiter 'issues series of terror threats against UK cities' over Twitter,” Independent (London), May 26, 2016, http://www.independent.co.uk/news/world/middle-east/sally-jones-isis-recruiter-issues-series-of-terror-threats-to-uk-cities-over-twitter-a7049066.html. “To be honest I wouldn’t go into Central London through June… or even July well to be honest I wouldn’t go there at all especially by Tube.”Alexandra Sims, “Sally Jones: Isis recruiter 'issues series of terror threats against UK cities' over Twitter,” Independent (London), May 26, 2016, http://www.independent.co.uk/news/world/middle-east/sally-jones-isis-recruiter-issues-series-of-terror-threats-to-uk-cities-over-twitter-a7049066.html. “After threats off #ISIS Navy Seal Robert O'Neil admits that ‘ America is becoming a weak nation ’ #Ouch https://www.youtube.com/watch?v=0iQaqzmCJeM …#RT :)” (Tweet)Umm Hussain Britaniya, Twitter post, October 7, 2015, 6:21, a.m., https://twitter.com/OumHu55a1n/status/651749090645155840. “‘They want to extinguish the light of Allah with their mouths, but Allah will perfect His light, although the disbelievers dislike it.’ 61-8” (Tweet)Umm Hussain Britaniya, Twitter post, October 5, 2015, 9:44, a.m., https://twitter.com/OumHu55a1n/status/651075603945275392. 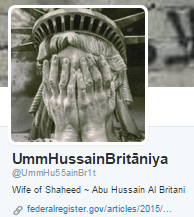 “American men fight me online as they aren't man enough to come here & fight my husbands brothers ..(no wonder your women are all over #ISIS)” (Tweet) Umm Hussain Britaniya, Twitter post, October 5, 2015, 3:02, p.m., https://twitter.com/OumHu55a1n/status/651155504694059009. “ISIS extremists ‘publish address of Navy Seal who killed Bin Laden and call for his death’ http://www.express.co.uk/news/world/610089/ISIS-call-for-death-man-who-killed-Osama-Bin-Laden-Islamic-State-Robert-O-Neill-9-11-USA …#RT #ISIS” (Tweet)Umm Hussain Britaniya, Twitter post, October 5, 2015, 4:41, p.m., https://twitter.com/OumHu55a1n/status/651180354519199744. “ ‘We will cast terror into the hearts of those who disbelieve.’ Surat Ali Amran” (Tweet)Umm Hussain Britaniya, Twitter, accessed October 3, 2015. “The Crusaders think they win when they kill us. They don't we win.” (Tweet)Tom Whitehead, “Widow of British jihadist 'proud' he was killed by US,” Telegraph (London), September 15, 2015, http://www.telegraph.co.uk/news/worldnews/islamic-state/11866046/Widow-of-British-jihadist-proud-he-was-killed-by-US.html. “I’m proud my husband was killed by the biggest enemy of Allah, may Allah be pleased with him, and I will never ever love anyone but him <3.” (Tweet)Tom Whitehead, “Widow of British jihadist 'proud' he was killed by US,” Telegraph (London), September 15, 2015, http://www.telegraph.co.uk/news/worldnews/islamic-state/11866046/Widow-of-British-jihadist-proud-he-was-killed-by-US.html. 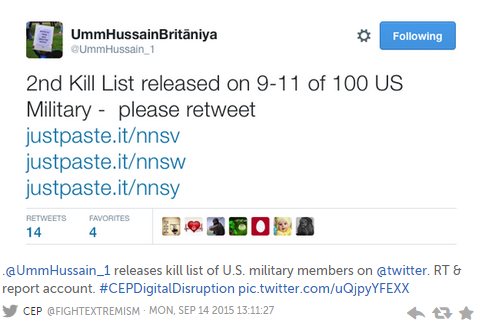 “2nd kill list released on 9-11 of 100 US military – please retweet.” (Tweet)CEP, Twitter post, September 14, 2015, 10:11 a.m., https://twitter.com/FightExtremism/status/643472139912388608. “My husband said he wanted me to carry on if he got shaheed [martyred] … I do not fear the Kuffar [infidels]. ENGLAND hates me – praise be to god.” (Tweet)Shiv Malik, “The British Islamic State members facing UN sanctions – profiles,” Guardian (London) September 28, 2015, http://www.theguardian.com/world/2015/sep/29/four-british-members-islamic-state-sanctioned-un-profiles. “’We will cast terror into the hearts of those who disbelieve’ - Surat 'Āli `Imrān” (Tweet) Umm HussainBritāniya, Twitter post, August 11, 7:24 a.m., https://twitter.com/UmmHussain_16/status/631108813572153348. “O Allah! Defeat the Coalition! Defeat them and shake them and give us victory over them!” (Tweet)Umm Hussain Britaniya, Twitter, accessed July 14, 2015, https://twitter.com/UmmHussain_10. “‘If you do not stop fighting us, then know that we have soldiers who do not sleep.’ – Abu Bakar al Baghdadi!” (Tweet)Umm Hussain Britaniya, Twitter, accessed July 14, 2015, https://twitter.com/UmmHussain_10. “‘O soldiers of the Caliphate, be firm for you are upon the truth. Be firm for Allah is with you’ -Mujahid Shaykh Abu Muhammad al-'Adnani” (Tweet)UmmHussainBritāniya, Twitter post, June 11, 2015, 6:01 p.m., https://twitter.com/UmmHussain110/status/609118355677679617. “You Christians all need beheading with a nice blunt knife and stuck on the railings at Raqqa... Come here I’ll do it for you!” (Tweet)Robert Mendick and Robert Verkaik, “British female jihadis sign up to the Islamic State's all-women police force,” Telegraph (London), September 7, 2014, http://www.telegraph.co.uk/news/uknews/terrorism-in-the-uk/11079386/British-female-jihadis-sign-up-to-the-Islamic-States-all-women-police-force.html. “Alhamdulillah me and my husband made it to the Islamic State after being stuck in Idlib for 7 mnths & are now living in the khilafah #isis” (Tweet, undated)Chris Greenwood, “Revealed: Benefits mother-of-two from Kent once in all-girl rock band who is now jihadi in Syria - and wants to ‘behead Christians with a blunt knife’,” Daily Mail (London), August 31, 2014, http://www.dailymail.co.uk/news/article-2739006/Revealed-How-middle-aged-mother-two-Kent-used-girl-rock-band-reinvented-jihadi-threatening-behead-Christians-blunt-knife.html#ixzz3cr4rMwHo. “My husband is away at training camp at the moment refreshing his ‘kaafir killing skills’ …Don’t all cry though he’ll be back soon :)” (Tweet, undated)Chris Greenwood, “Revealed: Benefits mother-of-two from Kent once in all-girl rock band who is now jihadi in Syria - and wants to ‘behead Christians with a blunt knife’,” Daily Mail (London), August 31, 2014, http://www.dailymail.co.uk/news/article-2739006/Revealed-How-middle-aged-mother-two-Kent-used-girl-rock-band-reinvented-jihadi-threatening-behead-Christians-blunt-knife.html#ixzz3cr4rMwHo. “Women dont have careers sis under sharia law… We are wives we are expected to look after our men. They look after u. U will never want for money again u live a good life here. U need to get married to get a house im just being honest with u but there are loads of men.”Colleen Curry, “A British Mother Reportedly Left Welfare Behind and Is Now Helping Recruit For The Islamic State,” Vice News, December 22, 2014, https://news.vice.com/article/a-british-mother-reportedly-left-welfare-behind-and-is-now-helping-recruit-for-the-islamic-state.